Researchers use a non-invasive procedure called Transcranial Magnetic Stimulation to jumpstart a region of the brain that’s involved in forming memories. By Jessica Berman – WASHINGTON—People with cognitive problems – including memory loss due to Alzheimer’s disease – may someday be able to have their memory boosted with electric current. Researchers used a non-invasive procedure called Transcranial Magnetic Stimulation to jumpstart a region of the brain that’s involved in forming memories. Known as TMS, the technique uses a mild electrical current through the skull to strengthen communication among brain cells involved in memory. It could lead to new treatments for memory impairments caused by trauma, illness or aging. Current therapies – such as surgery and drugs – have not proven effective. The neurons targeted by Transcranial Magnetic Stimulation are part of a pathway to the hippocampus, a deep brain region that’s involved in the formation of memories. 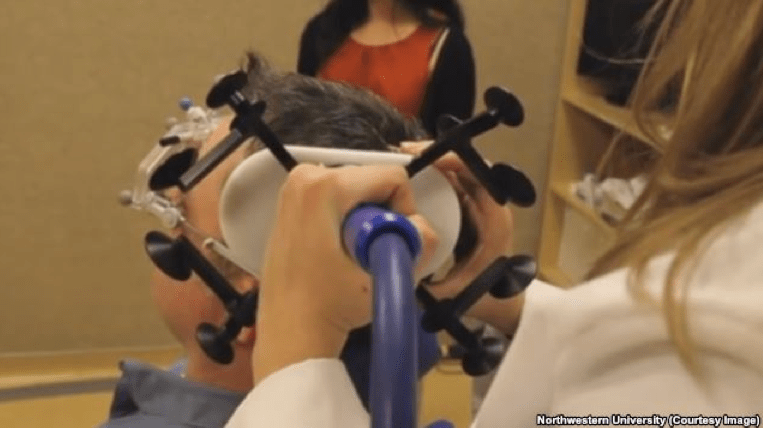 Neuroscientist Joel Voss at Northwestern University Feinberg School of Medicine in Illinois explained that the stimulation is painless and non-invasive. “What the TMS coil does is it produces a volley of pulses of this stimulation. And so it sounds like a high frequency tapping sound – like a duh, duh, duh, duh tapping sound – with about 20 clicks per second. And those clicks are aimed at the back part of the person’s head over the parietal cortex, and each one feels like a very slight tapping sensation on the outside of the head,” said Voss. In a study involving 16 healthy adults, ages 21 to 40, researchers took detailed anatomical pictures of the brain using MRI. The imaging mapped each participant’s neural network. The subjects were then asked to look at pictures of faces and remember a random word associated with each image. The participants underwent 20 minutes of TMS each day for five consecutive days. During the week, and 24 hours after the final stimulation, the individuals were rechecked on the arbitrary picture-word association test and underwent more brain imaging. Writing in the journal Science, Voss said his team found the individuals’ memories had improved after TMS, and the MRI showed the memory neurons became more synchronized with each other and the hippocampus. “This specific hippocampal network that we showed that we can manipulate is the exact network that is problematic in a variety of memory disorders, including memory disorders that occur from brain damage after stroke and cardiac arrest, traumatic brain injury from concussions or blast injuries… normal memory problems that older adults often experience as well as neurodegenerative disorders of age like Alzheimer’s disease,” said Voss. Voss said the next step is to try to boost the memories of older adults and those with mild cognitive impairment using Transcranial Magnetic Stimulation. He said healthy people should not try to boost their memories with TMS since it’s still experimental.